Perhaps because I got up at 4 a.m. this morning, this day has seemed very long. Not long in a bad way. It’s just that with everything that happened today, I kept thinking it was later than it was. Earlier in the morning I had looked out the window to look at the clouds and I noticed a goose sitting in a courtyard below us. At various times through the morning I looked out at him. One time JJ joined me and another time EJ did. The goose remain there all morning. He (or she) threatened to attack anyone who walked by, and many people jumped over a low walk rather than get too close to the goose. It was pretty entertaining. I wondered if the goose had a nest nearby. This morning…10? 11? We were told that JJ’s discharge was approved and he could get ready to leave at any time. From that moment, life got busy. I packed everything and EJ took a load down to the car while I helped JJ get dressed. Then EJ went to the hospital deli to buy us yummy sandwiches for lunch while I asked a nurse if she could tell us if JJ’s prescriptions had been called in to the hospital pharmacy yet (they hadn’t). EJ brought the sandwiches back and I packed them away. Then the prescriptions were ready and EJ went down to get pick up the prescriptions while I waited for the nurse. After a bit, she came and took the IV thingys out of JJ’s arm, went over the home care instructions with us, had JJ sign his discharge papers, and told us the guy with the wheelchair would be up in a few minutes to take JJ to the car. 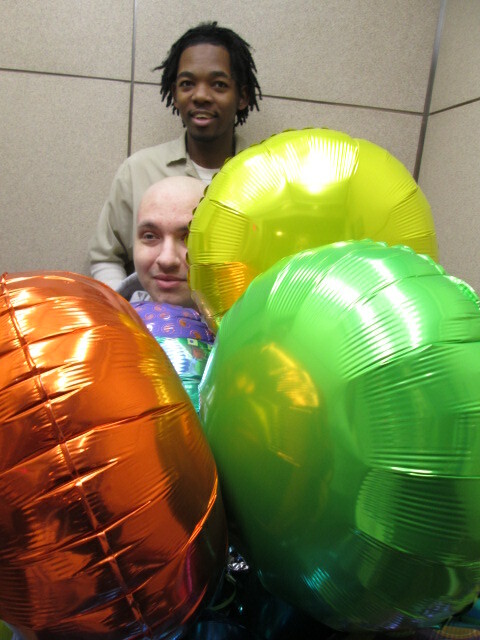 JJ (with the wheelchair guy behind him) in the elevator with his balloons. We passed the pharmacy on our way to the door, so we paused and waited for EJ to get the prescriptions. A little girl with her father saw JJ’s balloons and kept saying, “Daddy, I want a balloon. Can I have a balloon, Daddy?” So JJ took gave her one of his balloons. She was so happy. After EJ got the prescriptions, we all continued on our way. When we reached the lobby, EJ hurried to get the car while JJ, the wheelchair guy, and I waited. Every time the front door opened–which was a lot–the wind blew the balloons into JJ’s face. it was pretty funny. We finally got in the car and on our way to the hotel. It was quite an ordeal getting JJ and the luggage up to our hotel room while EJ parked the car. At last we got JJ in the room and settling on the couch. Later, after he had rested, EJ and JJ went down to the little hotel store and got JJ themselves some ice cream. They returned to say that ambulance people were taking out a person from the room across the hall. I have a friend that I haven’t seen since we played together as children. We reconnected on FB a few months ago. She realized that we were in her area–she lives in Indianapolis–so she stopped by to visit this evening. She brought us two pizzas from Whole Foods. They had interesting and yummy toppings. she also brought little desserts that were delicious. We all really enjoyed her visit. I expect it will be a long tiring drive, but home is at the end of it.